The pathetic jobs report has ushered in a whole new blame game on the weather. January through March 2012 had the warmest temperatures on record for the United States. Most economic data, including the employment report, is seasonally adjusted. The algorithm is called X-12-ARIMA and is maintained by the Census. Without going into the mathematics, this algorithm takes past cyclical patterns that are predictable and adjusts those spikes, attributed to the seasons. The algorithm takes out of an economic data series those wild swings, so one can more easily compare real growth instead of, say, fall harvesting or Christmas hiring. Construction employment, for example, is highly cyclical due to the nature of the work. 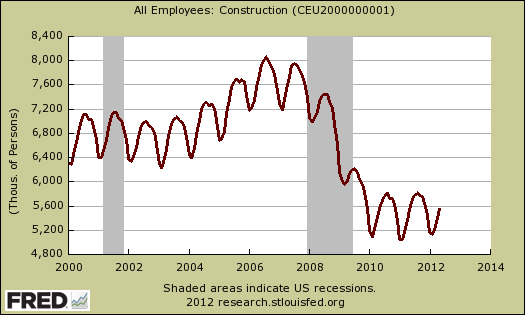 Below is a graph of not seasonally adjusted construction employment. 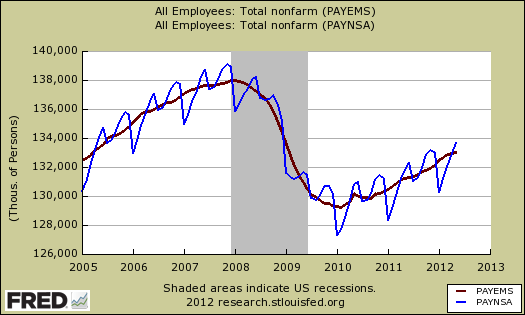 The below graph shows seasonally adjusted payroll jobs in comparison to the not seasonally adjusted payrolls. The maroon line is seasonally adjusted, the blue line is not. See how the blue line oscillates around the red? Seasonal adjustments act as smoothing filters, so one can more easily see real growth, not just the change of the seasons. Below is the same graph above, blown up. 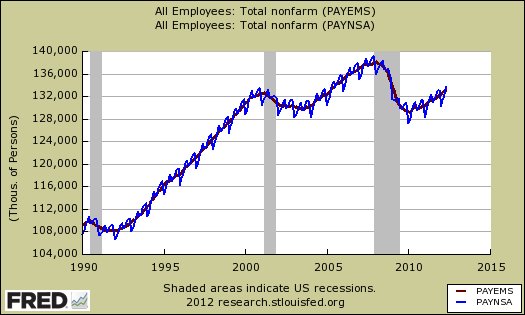 See the decline during January for the not seasonally adjusted payroll employment numbers? That's when there is less hiring due to weather. The problem with the seasonal adjustment algorithm is when we get economic tsunami events, such as this recession. Those changes can distort seasonal adjustments, depending when those cliffs, such as the jobs slaughter of 2009, occur in the seasonal cycle. Additionally, unusual warm weather can throw off the seasonal adjustment. For example, if construction can be done in January, needless to say, more construction workers would be hired than normal in the winter months. Additionally, when an economic tsunami happens, such as a jobs slaughter, employers may do a one time hiring on their staffs, due to their reactionary overkill earlier. Businesses may have a one time boost up to accommodate for their over-reactionary slow down during the economic maelstrom period. That said, real GDP is seasonally adjusted and for the warmest months on record we had only 1.9% Q1 real GDP growth. Okun's law is a loose correlation of overall economic growth to employment. Without going into Okun's law nitty gritty, we have GDP growth that is classified as treading water. We simply do not have enough economic growth to create jobs. Basically Okun's law says for every for every 1% increase in the unemployment rate, you're down 2% in actual real GDP from what GDP could be or our economy's potential. The below graph shows the annual unemployment rate, how much real annual GDP is below it's potential by, and the inverse of annual payroll growth. The left scale, in red, is how much actual GDP is below potential GDP. The scale on the right is the unemployment rate change, in blue, and inverse payrolls percentage change, in green. One can see Okun's law loose correlation of 2% below potential GDP means a 1% uptick in the unemployment rate in the below graph. Think of potential GDP as a car engine. You may not be running at 210 mph, but some cars can handle those speeds, others cannot. That said, the potential real GDP is god awful, in other words we're drivin' a Ford Fiesta right now economically. 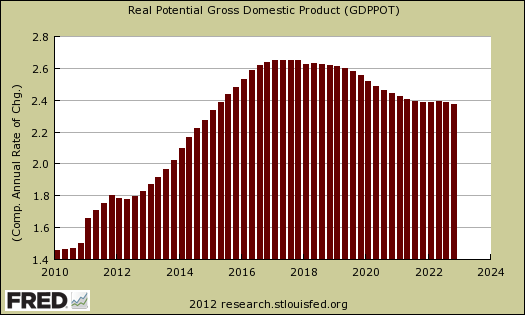 Additionally, we can see potential GDP matches Q1 2012 real GDP fairly well. Real potential output is adjusted for inflation and is estimated by the Congressional Budget Office. So, regardless of real GDP being above or below potential economic output, we simply do not have enough real economic growth to garner a jobs boom. This is ignoring all of our other problems with labor arbitrage, worker displacement, discrimination, wage repression, offshore outsourcing and the general destruction of the American work force and middle class. In terms of plain ole' economic growth, we ain't got enough to create a boom cycle to generate jobs. Bottom line. Others are blaming the the birth/death model for the low number of payroll jobs. The birth/death model is a statistical adjustment to compensate for new businesses and dead businesses who are not actually tallied by data reports. Those jobs created and died outside the statistical reporting time window due to lag. So, the BLS estimates how many jobs can be attributed to those firms which are not actually counted. This month's adjustment was 204,000 jobs. That said, the not seasonally adjusted May payrolls change was 789,000 jobs. One cannot directly subtract the birth/death model monthly numbers, to the 69,000 payrolls reported because that number is seasonally adjusted. The birth/death adjustment is not seasonally adjusted, but is correlated to survey data on new businesses and closed businesses that comes into the BLS at a later date. One must first add the birth/death model to the not seasonally adjusted payrolls data and then perform the seasonal adjustments. As one can see when looking at the not seasonally adjusted levels, the birth/death model seems almost too high. Considering 2008-2010 showed a record number of business closings, blaming the birth/death model as being too low for the pathetic lack of job creation is another red herring. Weather or no weather issues isn't the reason America is not generating jobs. Overall economic conditions are the cause. One can see this in a whole slew of poor economic data showings, including elevated filings for unemployment insurance benefits. Could policy makers make a difference? Hell yes. Will they? Hell no. Federal benefit extensions, which supplemented state funds for payments up to 99 weeks, were intended to tide over the unemployed until the job market improved. In February, when the program was set to expire, Congress renewed it, but also phased in a reduction of the number of weeks of extended aid and made it more difficult for states to qualify for the maximum aid. Since then, the jobless in 23 states have lost up to five months’ worth of benefits. Next month, an additional 70,000 people will lose benefits earlier than they presumed, bringing the number of people cut off prematurely this year to close to half a million, according to the National Employment Law Project. What a pathetic morass the United States is in. We have an ongoing jobs crisis and economic malaise, heading for half a decade strong and all the pundits can talk about is how this will affect 2012 elections. We've got news fer ya pundit nation, we don't care! Can anyone even remember when politicians acted in the national interest and not some lobbyist controlled agenda bought and paid for? Anyone at all remember when it was a sin to spin cause and effect as policy? To say giving more tax cuts to the rich would generate jobs, or to claim displacing U.S. workers by foreign guest workers would create jobs? All of these claims are pure baloney, and that's what we get from politicians these days, baloney, any side of the political equation. Pandering, issue mongering, all to get out that 1% of the vote which will swing an election, per state. What we need are direct jobs by any means necessary. See politicians put aside their differences to authorize some direct jobs, be it a direct payment for private businesses to hire U.S. citizens, to authorizing and managing infrastructure projects, to the creation of a WPA or CCC? Hell no, all they care about is keeping their own jobs in Congress, or getting someone else's in the White House. Thanks for taking the time to assemble this. It is informative! In case it wasn't clear, the message is yes, seasonal adjustments are probably out of whack, but they all use the same algorithm which would imply GDP was artificially boosted by the warm weather and still it's lukewarm.